During the 1970’s and 1980’s, however, there was an explosion in the presence of robots in manufacturing. 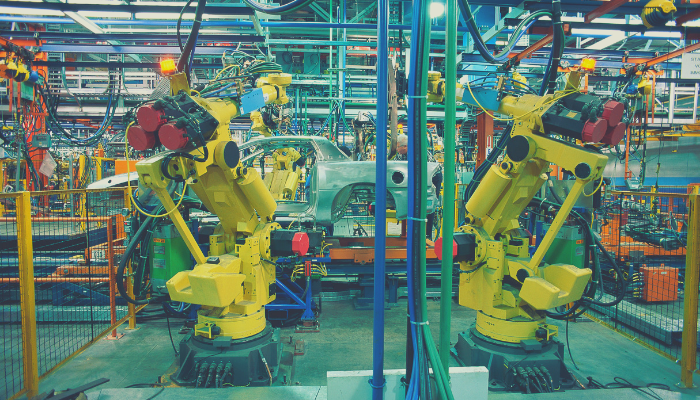 Car companies raced to get the newest and greatest technology and robots’ duties were expanded to include painting applications, materials handling, and arc welding. Advances in technology and circuitry made the cost of acquiring robots more affordable as well as more adaptable. It remains to be seen how robots and automation will continue to affect the manufacturing industry overall, but technology will certainly continue to impact manufacturing jobs. The initial fear that workers had is that robots would take their jobs— and that fear persists to this day. While robots do take the place of a human for doing dangerous tasks, there are factors of complexity, volume and margin that rule out robots for doing certain tasks. Yes, robots can do complex tasks, but if the volume and margins don’t offset the tremendous costs of robots then humans will continue doing those tasks. Technology and automation provide a more seamless connection between production and distribution chains, making the process from assembly to final customer an easier managed flow. In the coming years manufacturing workers will be doing less physical labor, data collection, and data processing. Real-time data analytics won’t require as much human interaction. However, there will be more human work needed for making judgements on the data collected and managing teams accordingly. Technology has the ability to transform entire industries. Accounting and bookkeeping were completely revolutionized by the use of software. The ability to work with digital data impacts the manufacturing process from end to end. By analyzing real-time data, businesses are able to react faster to market trends and respond to customer feedback. This efficiency results in much higher productivity in the workplace. Jobs that are less repetitive and more thought intensive make workers feel more valued and increase the positive culture of the workplace. Studies show that a positive workplace culture results in an increase of productivity. Advances in technology will impact every aspect of the manufacturing sector. Robots of the kind used now will continue to get cheaper, which will increase the already widespread use. AI has the potential to further revolutionize the technology used by manufacturing businesses. All these advances directly impact the type of work being done. While repetitive task work for humans is dwindling, new positions are being created. Current robots and automation require mechanical, electrical, and software care that were not required by more traditional machines. Many workers are being re-trained to take on these new challenges and new opportunities. McKinsey Global Institute (MGI) projects that if the adoption of automation is currently at a midpoint, roughly 15 percent of the global workforce, about 400 million workers, will be displaced by 2030. Another 8 to 9 percent will work in categories that don’t even exist yet. It will be critical for workers to be reskilled in order to stay in the workforce. It will continue to be important for manufacturers to staff their positions with skilled workers. Recruiting the right talent is as impactful as properly training and retaining knowledgeable employees. Your manufacturing company needs to work with a recruiter with the expertise to handle this task!